A Christening/Baby shower gift, these unique baby themed personalised gift boxes contain a delicious cookie mix for the recipient to bake at home. 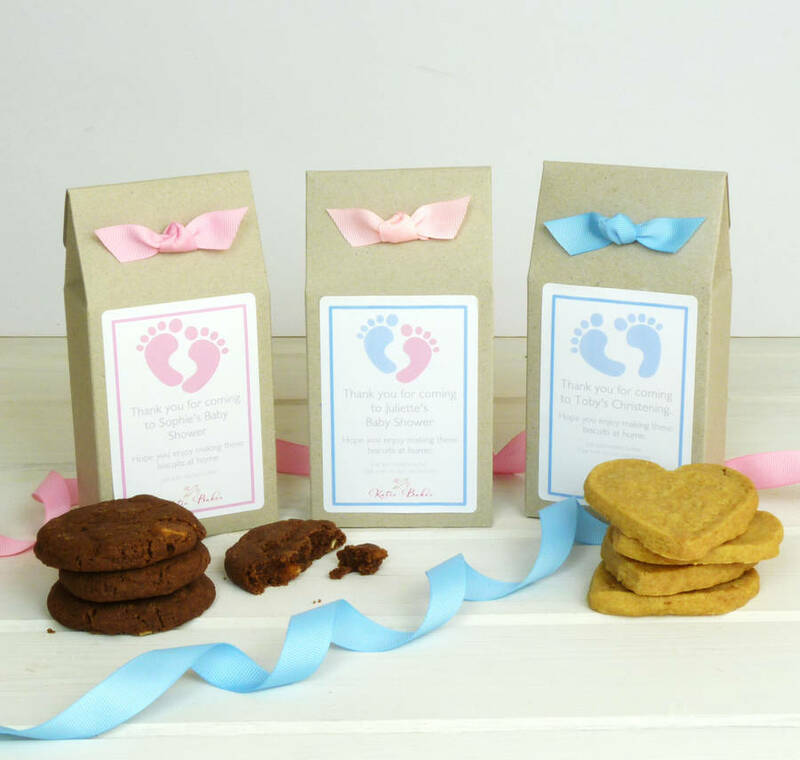 These foolproof cookie mixes, which produce delicious results, are packaged in a personalised gift box with a "Baby" themed label. The gift boxes make a lovely little gift for guests at Baby shower or to give to guests at Christening to say thank you. Alternatively, a great little present for a sibling after the birth of a new baby. The message on the boxes can be amended to suit any occasion so they could also be sent announcing the birth of a new baby or a Christening invitation. The cookie mixes are presented in stylish, eco friendly boxes, which can be personalised . The boxes are then finished with a colour coordinated, hand tied ribbon decoration. The mixes, which are blended by hand, contain the highest quality ingredients, including British flour and no artificial colours or flavourings. Each mix just requires the addition of melted butter (or dairy free alternative) to make delicious cookies. Full baking instructions are included. The mixes are available in two different flavours. Choose between Belgian Double Chocolate Chip or Rich Shortbread. We offer the label in a choice of pink or blue or a combination. The wording on the labels can be personalised with any short message you would like. Please enter your message in the relevant box when placing your order. If the quantity you require isn't listed please contact us and we can add the option, alternatively add multiples to your basket to make up the required numbers. Please note you will only be charged once for delivery.